I have a copy of the account of the Collingwood Battalion's history from formation in 1914 to its final disbanding after it's decimation at the 3rd Battle of Krithia on 4Th June 1915. Important information is contained within it including photos and bibliographies of individual officers, company photos, photos of grouped NCOs and also listings of all the enlisted men including addresses and their fate after 4th June. Anybody who has ancestors or other connections to the Collingwoods please ask and I will try and find info on them. I would be very interested to know if there is any information about the medical officers attached to the battalion. I have access to Arthur Gaskell's History of the Medical Unit of the Royal Naval Division (published in the Journal of the RN Medical Service) and it would be interesting to compare. Surgeon Charles Frank SCHULER RN is listed as the Battalion MO and there is a photograph of him. He went on to serve with Howe, Anson and Hawke Battalions of the RND in 1916-16. As Horatio2 kindly pointed out Charles Schuler was the Battalion MO. His picture and short bibliography are below. He was listed as wounded on June 4th. Thank you both! I will investigate next week and see if I have anything else on the gentleman. Husband's grandfather joined Collingwood as OS on 8/9/1914. His service record indicates he was interned, possibly at Groningen from October 1914 until the end of the war. I'm interested in any information about action and internment, including general picture of life in the camp. The record states 'on leave from Holland from 27/2/18 to 26/3/18' - how was this possible? His name was Reginald Guest, he was from Greasbrough, Rotherham, born 1890 and his service number was K.W/885. He spent some of his time in internment in making picture frames by embroidering insignia onto pieces of what seems to be army shirt - I have 2 of these in my possession. Leave from internment to UK was very common. The "Collingwood Battalion" document is mainly concerned with the 'new' battalion, re-formed after Antwerp and which went to Gallipoli in May 1915. This man's army and RNVR enlistment papers are held at the Fleet Air Arm Museum fleetairarm.enquiries@NMRN.org.uk . as H2 has pointed out the document covers mainly the preparation and fighting in 3rd Battle of Krithia in Gallipoli. 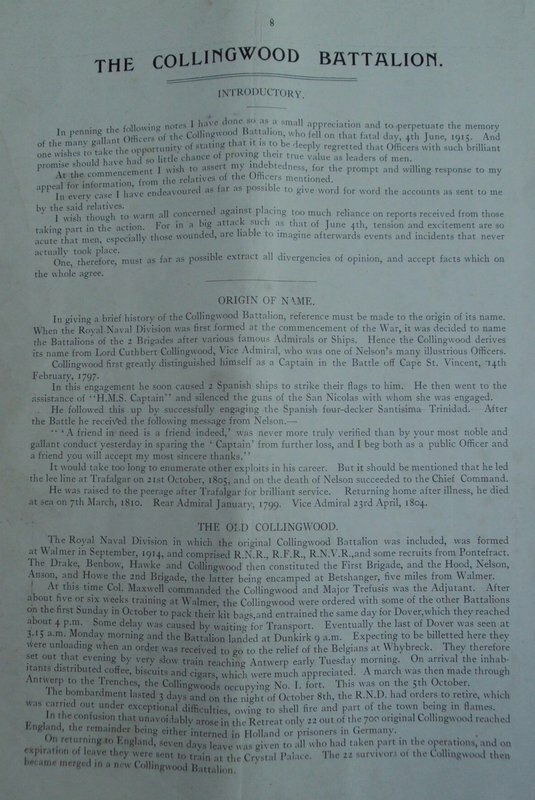 However there is one page that briefly describes the Battalion history and the Siege of Antwerp. H2 is quite correct that it was commonplace for internees to be granted leave to UK. 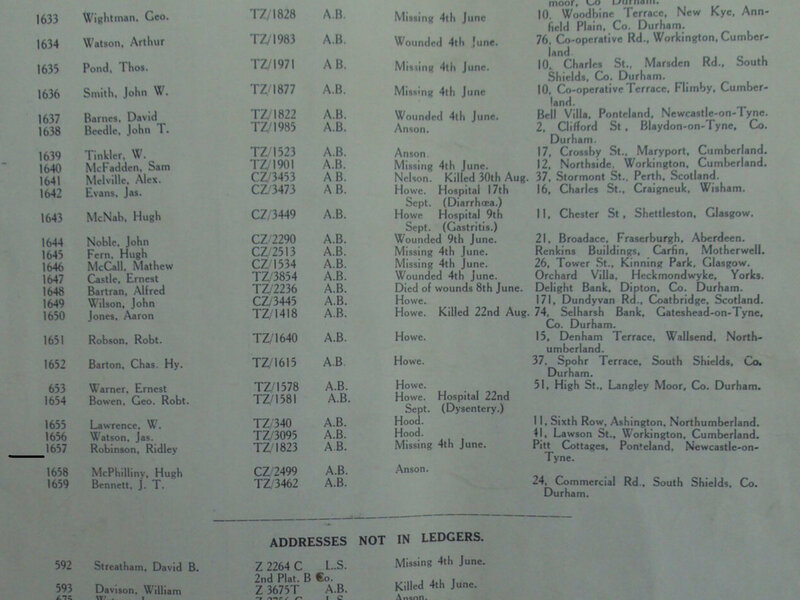 I obtained all my Grandfathers RNVR/RND Service Records from the Fleet Air Arm Museum. It cost £20 but was well worth it and they are extremely helpful. Below is the extract from the document that may be of interest. There is also a very good website regarding Gronigen Internment camp that may be of interest. The internees also produce a Camp Periodical which I have never been able to find online but I know copies are held at the IWM. Thank you, that's really interesting reading. The Illustrated War News, that Reg kept and passed down, describes the siege of Antwerp and says that afterwards, the battalions were 'misdirected by a spy' into Holland. I realise of course, that this was contemporary reporting where morale sometimes trumped accuracy in this periodical, but it was an interesting view. Strange that the text mentions 'Colingwood occupied Fort 1', as neither Fort 1, nor Redoubt 1 were ever in the area occupied by the Collingwood and the Fort itself was still under Belgian command and occupation. At one moment, more than half of the Belgian garrison left the fort (they were Liège and Namur veterans, they knew what happened to the concrete forts there and were now in a brick fort), but the commander of Fort2 was ordered to send a part of his garrison to Fort1. After they entered the fort, the bridges were blown (both in Fort1 and Fort2) to be sure nobody ran! During the retreat from Antwerp, the garrison of Fort2 escaped via a ladder over the moath, but the troops in Fort1 stayed put and the fort was the last of the inner ring to surrender. Fort1 was even in 1914 not longer part of the 2nd defensive line, which started in Fort2 towards the battery South on the Scheldt river southwards, and from Fort2 via trenches running west towards the Great Enceinte of the city. This area was covered (between Fort1 and Fort2) by the inundation of the Schijn river. The interval between Fort2 and Fort3 (including redoubt 1-3, although some Belgian artillerist were still defending those) was manned by the Hawke Battalion. I'm looking for any additional information you may have regarding Able Seaman Ridley Robinson (Z/1823). 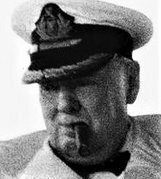 He was born on 18 Feb 1894 (although Naval Records may give the date as 11 Feb 1894) and died on 4 June 1915, presumably at the 4th Battle of Krithia. His mother's name is likely given as Mary Elizabeth Young of Prestwick Pitt (or Pit) Houses, Ponteland. Reported by Tyneside Z/2031 AB Alfred Edward Nicholson: "One of my best chums at Blandford Camp. When we left for Dardanelles, never saw him anymore." (Nicholson joined Anson Battalion 18/7/15, BW left shoulder 13/8/15, Discharged Invalided 25/3/16). ; Born 11/2/1894. A Miner. Son of Nichol & Mary Elizabeth Young, of Pitt Houses, Prestwick, Ponteland, Newcastle-on-Tyne, Northumberland, and was living with his father at the time of his enlistment. Enlisted 17/11/14 ; Joined Collingwood Battalion from 1st Reserve Battalion 9/5/15-4/6/15 Discharged Dead. The address is correct, that's where Ridley was in 1911. However, the father's name is wrong, as is date of birth. Mary Elizabeth's husband was Thomas John Young, and he was Ridley's stepfather. I'm new to this. How can I check the RND Roll of Honour? However, the father's name is wrong, as is date of birth. Nevertheless, this is the information he gave on enlisting. I have Ridley's birth certificate, and I know that is mother was a seventeen-year-old , unmarried, domestic servant, and that she registered his birth herself. This simply adds to the mystery. That's fine. This is AB Robinson’s entry in the book from the OP. His service number was TZ1823, the T signifying Tyneside Division of RNVR. Hi Lawryleslie, this line in your email caught my eye - I've seen the RNVR/RND service record index cards on Findmypast, but wasn't aware you could get hold of a full service record from the Fleet Air Arm Museum. Could you confirm if this is correct please, and give an idea what it contained? the Records I received were RNVR Attestation Certificate, Casualty Form B103 and a chronological record of communication regarding his injury and evacuation back home sent from frontline to RND HQ, probably at Crystal Palace. 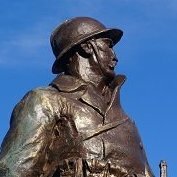 I already had his original full RNVR Service Record so that wasn’t at the FAAM plus I found his medal entitlement and Silver War Badge Award on Ancestry. i believe that the Archive Department at the FAAM are currently temporarily closed for re organising. The National Archives also hold RND Records but I find their website difficult to navigate. Correct about the Archive Department closed for 18 months; the same applies, as far as I can tell, across all the National Museum of the Royal Navy sites (certainly true of Portsmouth). Happy to help with The National Archives Discovery catalogue if anyone wants a search done. Thanks for this - from the FAAM website it appears there are full service records for RND men who were previously in the RNVR. I have no idea if this was the case for the person I'm interested in, and since the archives are closed it will be a long time before I can find out. A long shot but if your man was in Collingwood Battalion during Gallipoli campaign I can find this out from the book I have. If you want me to look I will need his name, rank and service number. If he was in the Collingwoods then at least you will know if he was also RNVR. Thanks for this offer - unfortunately he was in Drake.